As a snow and ice clearing company that’s about more than just our services, we work hard to integrate ourselves into the incredible communities that we support today. Having just bought property in West Milford, we’ve been working hard to acquaint ourselves with the community members and really get to know the people and businesses that make up the backbone of the West Milford community. Expanding our servicing area into a new region in 2018 has our team very excited, and we can’t wait to mingle even more with the West Milford community heading into the future. This past October, our Xtreme Snow Pros team took part in the West Milford Autumn Lights Festival: 23rd Annual Celebration of West Milford. As a celebration that is very important to the community, and one that has been going on for 23-years, we were very excited to be part of the event and introduce our team, our values and our services to all those in attendance. Taking place from 10AM until 5PM on Saturday, October 14th, over 250 vendors, children’s entertainment companies, and rides were available to the friends and families at the celebration. Starting at 10AM, the Character Parade, where children and parents paraded at the triangle starting at the Shoprite, presented kids and parents with the opportunity to sport their Halloween costumes. Princess Bella, Princess Poppy, Batman, Big Red Dog, and Blue Karate Turtle led the excursion, finishing just 1-hour later. The Xtreme Snow Pros team took part in the daily festivities, bringing along their HET as well as several other pieces of equipment that they showcased and discussed with all interested viewers. Children were able to see the pieces up close and personal, spending time to learn about what our team does during the dangerous winter months. 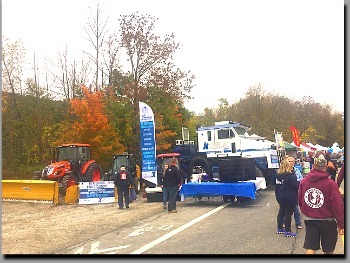 Working hard to network with everyone who stopped by, we had some awesome conversations with parents, students, and children thinking about going into a career of winter weather clearing and removal. To inspire that kind of excitement was really rewarding for our team.